Water is the preferential vector of flux and energy transfers within the Critical Zone (CZ). As it flows through the sub-surface compartments, the rock skeleton deforms. The amplitude of the deformations undergone by the medium cannot be perceived by man and depends essentially on the magnitude of underground fluid pressure gradients as well as the physical and structural properties of the reservoir rocks. However, there are special sensors used to record from ground surface the changes in the medium’s shape associated to the dynamics of subsurface. Thus, it is theoretically possible to describe the properties of reservoirs and to analyze their functioning (fig. 1) by linking deformation measurements and hydraulic head measurements. Fig. 1: Surface hydrogeodesis principle for fractured reservoirs modified according to Schuite (2016). 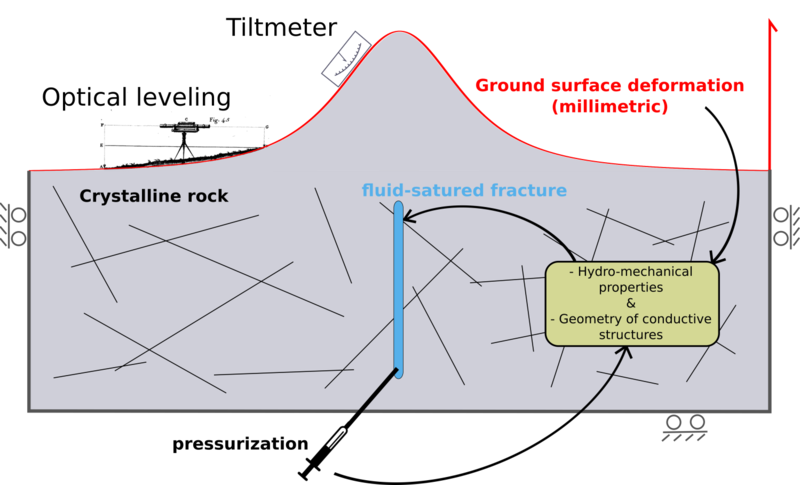 In WP2.2, we assessed the potential and sensitivity of some geodetic instruments as tools for characterizing subsurface properties and processes related to the fluid flow at multiple scales of space and time (fig. 2). The approach was also based on a methodological development to identify the optimal way to use these tools and analyze their data to “feel the pulse” of the CZ. Fig. 2: Spatio-temporal coverage of various hydrogeodetic tools as regards to hydromechanical and hydrological processes taking place in fractured reservoirs. From Schuite (2016). There are many ways of measuring ground surface motion. 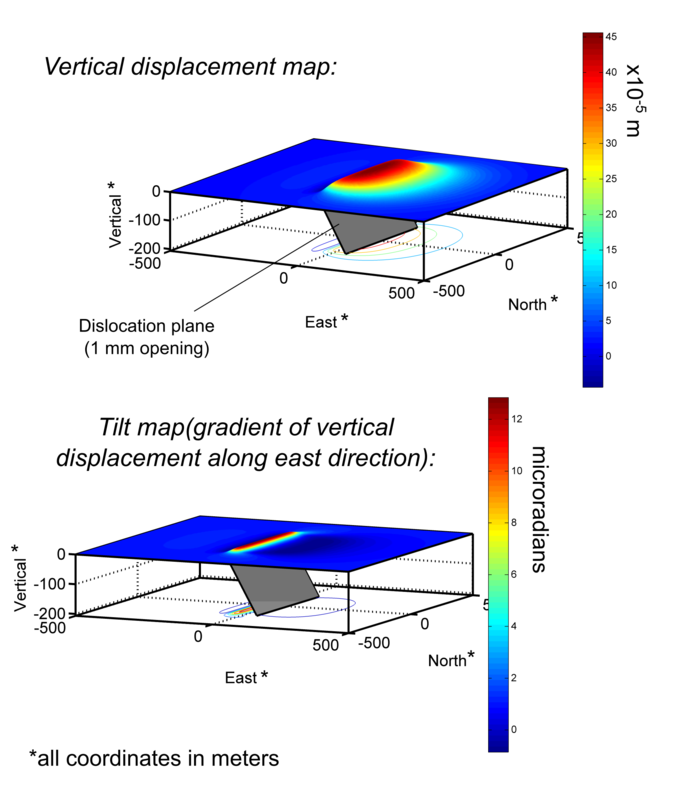 Here, we mainly used tiltmeters, which do not directly record ground vertical displacements but rather variations in local slope in one direction (hence, an angle in radians). These tools have the advantage of being sensitive to very small deformations, down to angular variations equivalent to 1 mm over a baseline of 1000 km. Several of these instruments are installed and continuously recording at the pumping site of the Ploemeur hydrogeological observatory (H+), which is situated in a fractured hardrock context. We differentiate long baseline hydrostatic tiltmeters (fig. 3 & 4), that are outstandingly stable and precise, and short baseline pendular tiltmeters, that are much easier to deploy during ephemeral field experiments. Fig. 3: Sketch of a long baseline tiltmeter at initial equilibrium state (a) and after a ground motion (b). Photograph of a vessel (c) and internal armature holding the motion sensor (LVDT, d). From Schuite (2016). Fig. 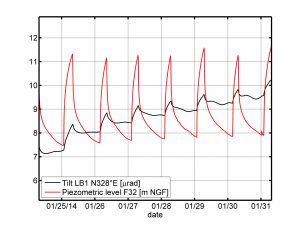 4: Sample of piezometric time series recorded in a well drilled through the fault zone at the Ploemeur site (red) and associated long baseline tilt series (black, after earth tides filtering is made). From Schuite (2016). At the scale of 1 to 10 m, pendular tiltmeters were used within an experimental and methodological development framework aiming at studying the mechanical behavior of natural fractures, with an integrative view of their response to weak and periodic hydraulic perturbation. Indeed, fluid pressure variations induce changes in fracture aperture, and this deformation propagates through the medium up to the surface where tiltmeters are emplaced. Hence, these latter feel the indirect mechanical effect of pressure oscillations in fractures. By taking advantage of the signal’s signature in the frequency domain and by applying appropriate processing techniques, small tilt amplitudes due to the hydraulic load have been detected. The recovered tilt response have subsequently been interpreted in terms of fracture mechanical properties and behavior. This novel experimental approach is the fruit of transversal developments involving WPs 2.2 and 7.2. At the scale of ~100 m, we have first demonstrated the interest and usefulness of surface geodetic methods (tiltmeters and optical leveling) to image hydraulically active structures such as fault zones (fig. 5). Then from 3D numerical models, we have revealed that the transient evolution of tilt depends especially on the contrasts in mechanical and hydrodynamical properties between fault and surrounding fractured bedrock (or matrix). Surprisingly, we have noticed that the temporal ratio of tilt over head changes in the fault during a hydraulic test of several hours is a marker that can be used to distinguish the effect of flow in the two compartments (namely fault and matrix). 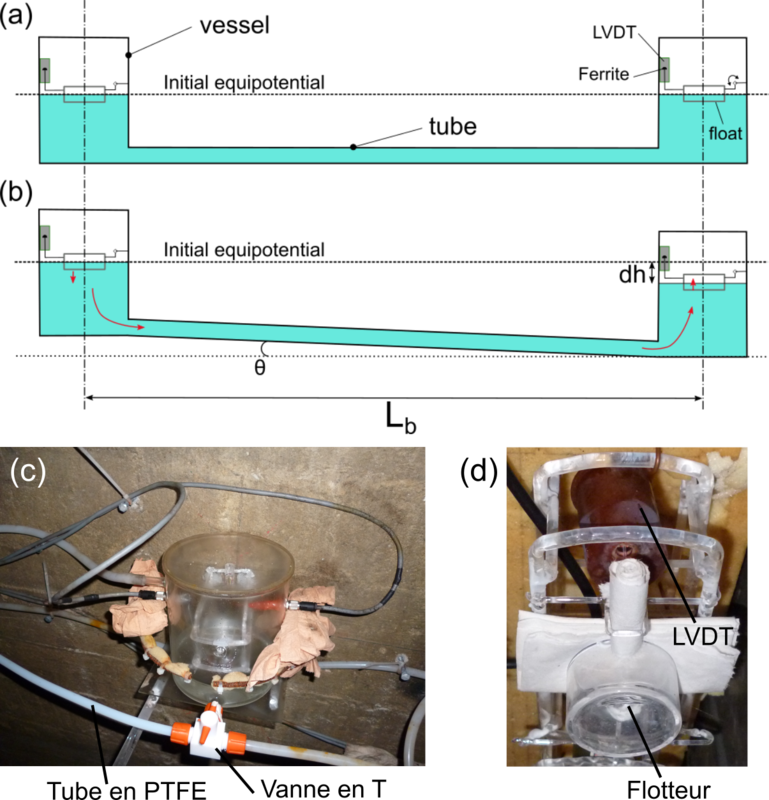 These results show that tiltmeters can now be considered as an efficient and far-reaching tool for fractured media hydrology. Fig.5: Example of modeled deformation maps generated by the opening of an underlying fracture (in grey). From Schuite (2016). 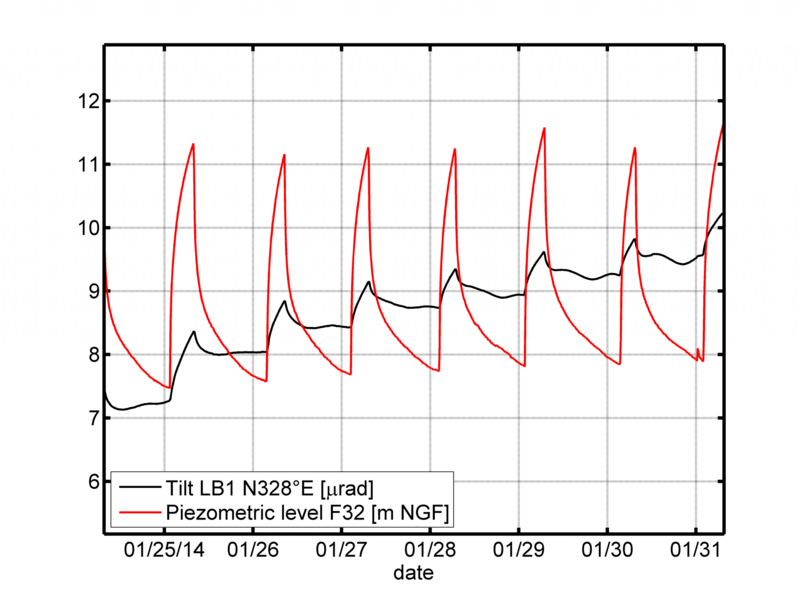 At the scale of a fractured reservoir as a whole (~ km), multi-annual time series are well correlated with the corresponding piezometric time series at the Ploemeur site, which are sub-periodic. The only main difference is that tilt series exhibit a phase lead of about a month. 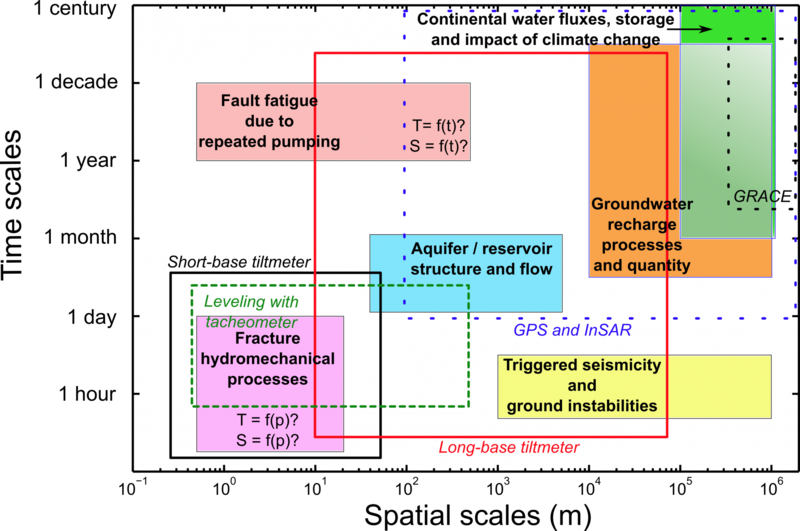 These observations show once more that at this scale, tiltmeters are sensitive to deep-seated fluxes, which is of major interest for scientific questions on aquifer recharge. The interpretation of long-term hydrogeodetic data with a semi-analytical hydromechanical model has been successfully implemented as it is able to reproduce the observed amplitudes and phase shifts. In addition, tiltmeters are shown to be sensitive to recharge processes (diffuse versus local). On the long run, the idea is to directly inverse tilt measurements to estimate the quantity of meteoric water that feeds the aquifer every year.